If your Windows PC seems buggier than usual after the recent round of Spectre patches, you might want to download this. If you’ve noticed any unexpected reboots or PC instability as a result of the recent Spectre patches, there’s a solution: Microsoft has issued an emergency Windows patch that rolls back the recent Spectre mitigations. Confused? It’s a bit complicated. 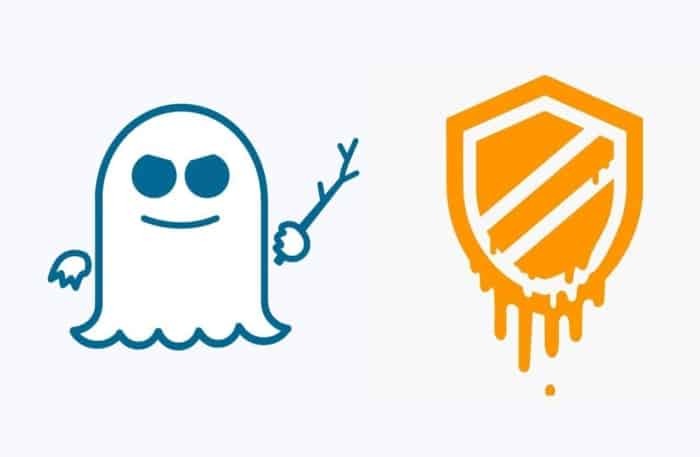 After the intial Spectre and Meltdown vulnerabilites were disclosed, both Intel and Microsoft hustled out patches to mitigate the problem. Unfortunately, Intel’s latest microcode updates—and the BIOS updates from PC makers based upon them—were themselves buggy, causing instability, reboots, and data loss in some PCs. Note that the patch notes specifically state that you should run this patch “if you are running an impacted device” (emphasis ours). In other words, if your system is working normally, don’t bother downloading this patch. This is what Microsoft calls an “out of band” patch, and it doesn’t appear that it will be made available via Windows Update, either. Why should you consider it? Intel has warned previously that the faulty patch can sometimes cause data loss and corruption, and Microsoft is saying the same: “Our own experience is that system instability can in some circumstances cause data loss or corruption,” the patch notes state. There’s another wrinkle, though. As part of the patch, Microsoft is allowing users to edit the Windows registry to toggle the mitigations on or off. (Instructions are here.) It’s possible to toggle Microsoft’s patch off, and then, when Intel solves its own patching problem, re-enable it. That scenario is actually what Microsoft recommends—again, only if you’ve noticed system instability and want to take action against it. Toggling the mitigations on and off is also a feature of the latest InSpectre utility. As Bleeping Computer noted, system makers such as Dell and HP also advise rolling back their own BIOS patches to an earlier version, which they’re redeployed. 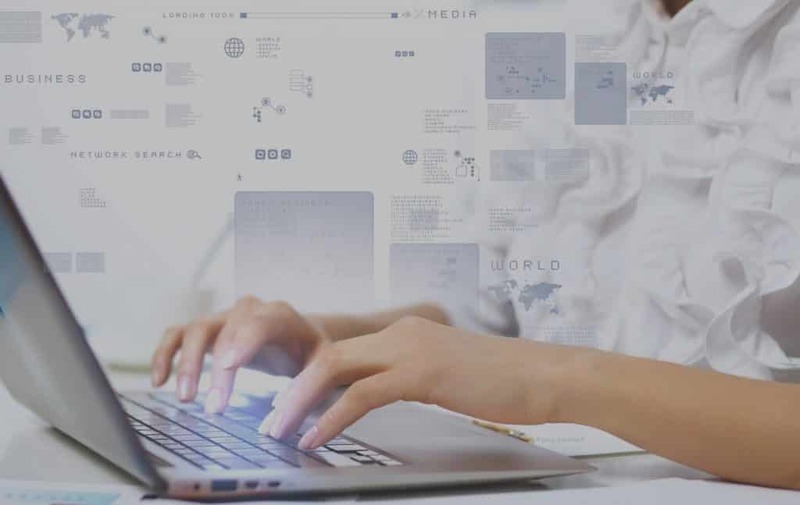 It’s all horrendously confusing for consumers and IT organizations alike. Fortunately, at least, there haven’t been any public cases of these vulnerabilities being exploited, Microsoft says. What should you do? There’s no one-size-fits-all answer to this question. But we can tell you what we’re doing: if a PC is working as expected, we’re leaving it patched and in place. If you’re backing up your data (to Remote Backup Services or an external drive) chances are your most crucial data will be saved in case your system goes down unexpectedly. Obviously, install Microsoft’s emergency Windows patch if you’re running into system issues. There’s no perfect solution—if you’re more paranoid than we are, feel free to deploy the patch even if your PC hasn’t hiccuped. Having opted against what would have been an uncharacteristic debut at the recent Consumer Electronics Show in Las Vegas — in teaser capacity or otherwise — Samsung is now gearing up to launch the 2018 versions of its flagship Galaxy S lineup in a much more traditional fashion, just prior to Barcelona’s Mobile World Congress. 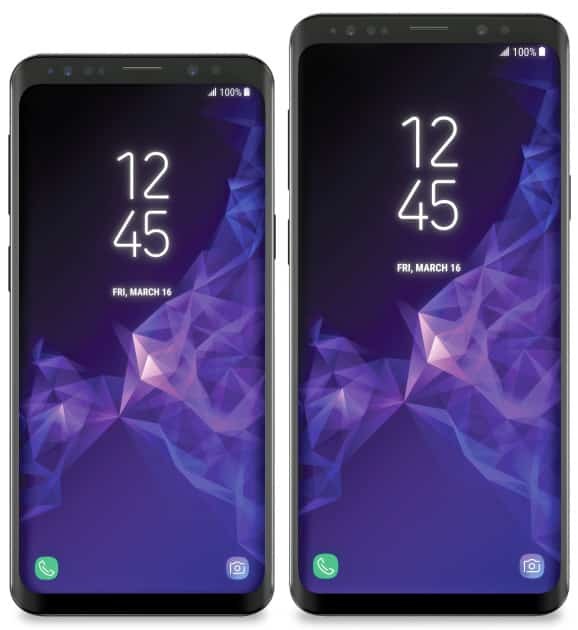 These are the Samsung Galaxy S9 and Galaxy S9+ (pictured top, left to right). As VentureBeat reported previously, more than screen dimensions will separate the two models this year (the Galaxy S8 and S8+, in contrast, are nearly identical save for their Super AMOLED display diagonals). However, as this year is mostly a component upgrade following a comprehensive redesign in 2017, neither the 5.8-inch S9 nor the 6.2-inch S9+ will be significant departures from their predecessors. Even in an industry built on iterative upgrades, these stand out as adhering closely to the existing script. Powered by Qualcomm Snapdragon 845 in the U.S. and China, and Samsung’s own Exynos 9810 systems-on-chip in the rest of the world, the first differentiator between the S9 siblings (codenamed Star and Star 2) lies in their memory configurations: 6GB of RAM and 128GB of internal storage for the S9+, but the same 4GB/64GB pairing as last generation for the standard S9. With this distribution of basic components, Samsung is making it more difficult for users, some of whom may even want a smaller screen, to choose the basic S9 without additional trade-offs. As the Unpacked invitation suggests, the main highlight for both the Galaxy S9 and Galaxy S9+ will be refreshed imaging hardware and software — a notion confirmed by two people briefed on Samsung’s plans. 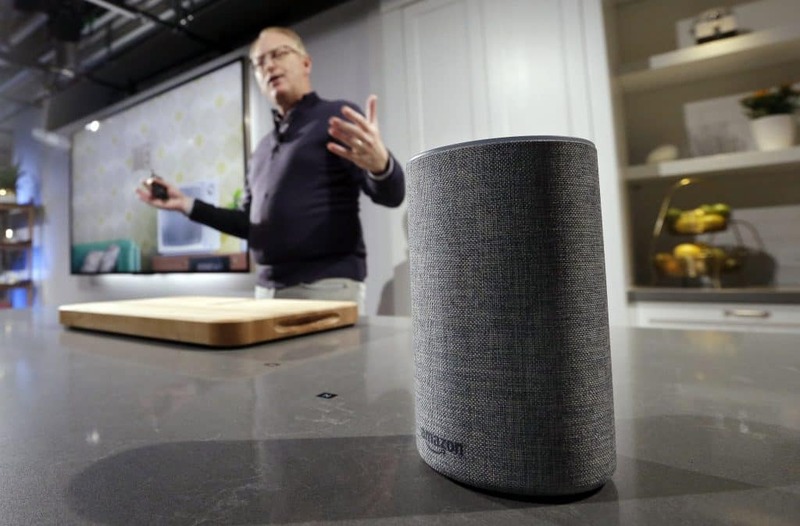 Besides motion-detected, “super slow-mo” video capture (rapid movement triggers 480fps recording at 720p), both devices are said to feature variable aperture on their primary 12-megapixel cameras. It’s a mechanical adjustment that switches between f/2.4 and smallest-in-class f/1.5. The Galaxy S9+ adds a second 12-megapixel rear module, but this one has a standard fixed aperture. In what will be important to many, all of the phones’ rear elements are aligned vertically, instead of horizontally like the S8, with the fingerprint scanner located more naturally at the bottom of the stack. Around front, both 2018 S-series models sport 8-megapixel selfie cams. On the bottom, another welcome change: stereo speakers. Expect the Galaxy S9 and Galaxy S9+ to begin shipping, and selling through retail, on March 16 (further evidenced by that date appearing in the official press shots). While initially the two Google experts didn’t reveal what Windows feature the bug was found in, the veil of mystery lifted yesterday when both Microsoft and the two experts shared more details about the issue. The researchers say the issue can be exploited with no user interaction needed. “Vulnerabilities in MsMpEng are among the most severe possible in Windows, due to the privilege, accessibility, and ubiquity of the service,” Tavis Ormandy, one of the Google researchers says. NT AUTHORITY\SYSTEM, a system-level user with no limitations. Furthermore, the service is included by default on all recent Windows operating system, exposing hundreds of millions of PCs to remote hacking. Unlike past incidents, where Microsoft has allowed exploited zero-day vulnerabilities to fester in the wild without being bothered to deliver a patch for months, this time around, the company moved lightning fast to address the issue. In just a few days, the company had prepared and already shipped a patch to fix the vulnerable MsMpEng service. 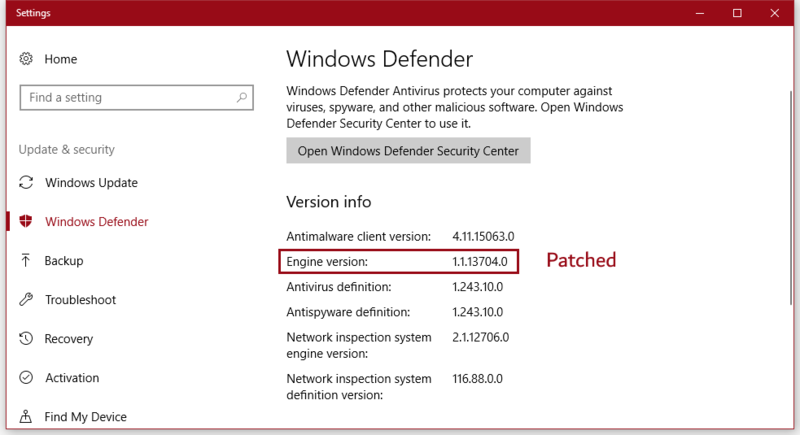 According to a Microsoft advisory, the first version of the Microsoft Malware Protection Engine affected by this flaw is v1.1.13701.0. The issue has been patched in v1.1.13704.0, released a few hours ago, and which has already reached some users (screenshot above). Microsoft also said that on latest Windows platforms, the risk of exploitation should be lower if the user has turned on Windows CFG (Control Flow Guard), a security feature that can make exploitation of memory-based vulnerabilities much harder. The vulnerability is tracked as CVE-2017-0290. The two Google researchers also released proof-of-concept exploit code. The entire exploit fits in a tweet. To help spread the word about this issue, US-CERT has also released an accompanying alert.